Supplement to Applied Radiology Volume 45 Number 11, supported by an unrestricted educational grant from Bracco Diagnostics, Inc.
Gadolinium-based contrast agents (GBCAs) have been in use since the late 1980s. The first to be approved by the U.S. Food and Drug Administration (FDA), in 1988, was the linear agent Magnevist® (gadopentetate dimeglumine), and the second, in 1992, was the macrocyclic agent ProHance® (gadoteridol). Both Magnevist® (gadopentetate dimeglumine) and ProHance® (gadoteridol) are non–tissue-specific, extracellular fluid (ECF) agents that were initially approved for imaging the central nervous system (CNS). Since then, an additional 7 GBCAs have been approved, 4 of which are also ECF agents (Table 1). The remaining 3 include MultiHance® (gadobenate dimeglumine), a dual ECF-liver GBCA, Eovist® (gadoxetate disodium), a liver imaging agent, and Ablavar® (gadofosveset trisodium), a blood pool agent (no longer being manufactured). 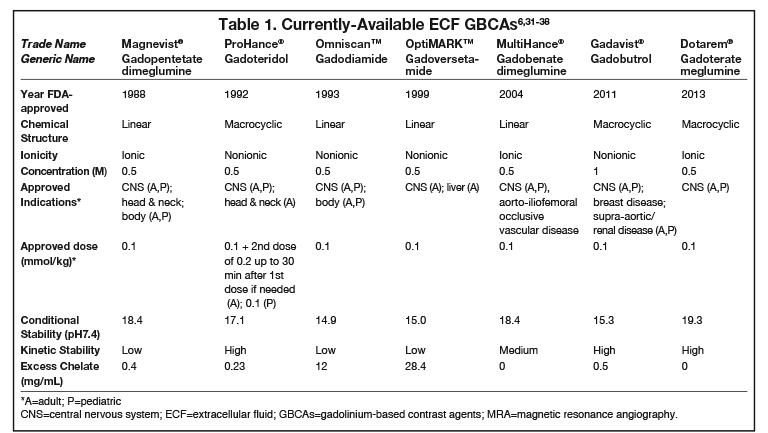 Among other properties, the 7 ECF agents (including MultiHance® [gadobenate dimeglumine]) vary in their chemical structure (macrocyclic or linear), concentration (0.5 or 1M), and stability, as well as their approved indications and doses (Table 1). Here we discuss with Dr. Matthew J. Kuhn, an early pioneer of contrast-enhanced MRI, his personal experience with each of the currently available GBCAs, as well as his preference for ProHance® (gadoteridol) for MR neuro and cardiac imaging applications. Applied Radiology (AR): Welcome, Dr. Kuhn. Can you please describe your imaging facility? Dr. Matthew J. Kuhn (MJK): I currently practice at 4 hospitals: UnityPoint Health-Methodist Hospital (500 beds), UnityPoint Health-Proctor Hospital (289 beds), Pekin Hospital (107 beds), and Galesburg Cottage Hospital (173 beds). Among these 4 sites, we have 10 scanners in total, most of which are GE and most of which are 1.5 or 3T, but we also have others. AR: Can you tell us about your experience with the various GBCAs currently in use for contrast-enhanced MRI? MJK: I first used contrast in 1987, as co-principal investigator on a compassionate-use study of Magnevist® (gadopentetate dimeglumine) in patients with brain tumors. This was prior to its subsequent approval in 1988. We continued to use Magnevist® (gadopentetate dimeglumine) post-approval, and I have administered this agent to many patients over the years; however, since it is known to be associated with nephrogenic systemic fibrosis (NSF), we didn’t see any benefit in continuing its use. So we have found that MultiHance® (gadobenate dimeglumine) is a great complement to ProHance® (gadoteridol) due to its higher relaxivity. I use only ProHance® (gadoteri dol) and MultiHance® (gadobenate dimeglumine). However, MultiHance® (gadobenate dimeglumine) is linear, and some radiologists may want the extra security of a macrocyclic agent in patients with low glomerular filtration rate (GFR). In some of our practices, in patients with a GFR <40, they will only use ProHance® (gadoteridol), while others are comfortable using MultiHance® (gadobenate dimeglumine) in these patients; it just depends on their policy. Note that there are no unconfounded NSF cases with either agent. In fact, very recently, we published a prospective, multicenter study to determine the incidence of NSF in patients with chronic kidney disease (CKD) exposed only to ProHance® (gadoteridol; n=171) or MultiHance® (gadobenate dimeglumine; n=363), and no cases of NSF were seen with either agent.9 These findings are consistent with the classification of these 2 agents as low-risk GBCAs. AR: Do you have personal experience with Omniscan™ (gadodiamide) or OptiMARK™ (gadoversetamide)? MJK: I did use the GBCA OptiMARK™ (gadoversetamide) early on, primarily for research, and I have used Omniscan™ (gadodiamide) only as a comparator, not for clinical use. Both of these agents are relatively unstable and considered higher risk for NSF (Table 1).10 In addition, we know that they are both formulated with excess chelate, and I don’t want my patients exposed to either unnecessary chelate or free gadolinium, both of which are more likely to be present with these agents. Biochemically, everything is in equilibrium – no agent has 100% gadolinium bound tight to the chelate – however, certainly, the unbound fraction is greater with Omniscan™ (gadodiamide) and OptiMARK™ (gadoversetamide) compared to other agents. AR: What about the most recently approved agents, such as Gadavist® (gadobutrol) and Dotarem® (gadoterate meglumine)? MJK: The newest agent on the market, Dotarem® (gadoterate meglumine), was actually the second agent approved in the world after Magnevist® (gadopentetate dimeglumine), but was only available in Europe for a very long time. I have no personal experience with this agent. Gadavist® (gadobutrol) is another relatively new agent and this agent has twice the concentration of gadolinium (1M) vs the other agents (0.5M). I have used it, but I have limited experience with this agent. We often use half dose in patients with renal dysfunction, and for most agents, this translates to half volume. When it comes to Gadavist® (gadobutrol), this would mean quarter volume, and we did have a tech give half volume Gadavist® (gadobutrol) to a patient, which is essentially overdosing a patient with CKD. So I find this difference in concentration adds an unnecessary layer of complexity. AR: Can you describe in more detail the attributes that you think are most important in selecting a GBCA? MJK: Absolutely. I like to consider 3 things: safety, efficacy, and versatility. You always want to use the safest agent for your patient – for reduction of adverse events (AEs), side effects, and NSF. In a large study of over 28,000 patients, AEs associated with administration of ProHance® (gadoteridol) have been demonstrated to be exceedingly low.11 In addition, in terms of NSF, ProHance® (gadoteridol) is in the safest class of agents (Class II). 10 Importantly, ProHance® (gadoteridol) has demonstrated efficacy and safety in children,4,12 and has a pediatric indication.6 In children, the greater stability of a macrocyclic agent is potentially even more important, as they have longer lives ahead of them. AR: Lately, there has been much discussion among radiologists and the public regarding gadolinium deposition in the brain. What is your thinking on this topic? Kuhn MJ, Youssef HT, Swenson LC, Gleason TJ. Comparison of triple dose gadoteridol with standard dose gadopentetate dimeglumine in the evaluation of intracranial lesions. J Magn Reson Imaging. 1993;3(P):100. Kuhn MJ, Hammer GM, Swenson LC, Youssef HT, Gleason TJ. MRI evaluation of “solitary” brain metastases with triple-dose gadoteridol: comparison with contrast-enhanced CT and conventional-dose gadopentetate dimeglumine MRI studies in the same patients. Comput Med Imaging Graph. 1994;18:391-399. Youssef H, Kuhn M, Hammer G, Meis L, Burk T, Pencek T. Phase III multicenter evaluation of high-dose gadoteridol in neurologic pathology: comparison of 0.1 mmol/kg gadopentetate dimeglumine and 0.3 mmol/kg gadoteridol in patients with lesions of the CNS. Neuroradiology. 1995;37:558-559. Kuhn MJ, Swenson LC, Youssef HT, Hammer GM, Gleason TJ, Binstadt DH. Safety and sensitivity of high dose gadoteridol in children. Proceedings from the Thirty-sixth annual meeting of the Society for Pediatric Radiology. 1993;95. Mayr NA, Yuh WTC, Muhonen MG. et al. Cost/benefit analysis of high-dose MR contrast studies in the evaluation of brain metastases (abstr). In: American Society of Neuroradiology Book of Abstracts. 1993;193-194. ProHance® (Gadoteridol) Injection, [prescribing information]. Princeton, NJ: Bracco Diagnostics Inc.; November 2013. Kuhn MJ, Picozzi P, Maldjian JA, et al. Evaluation of intraaxial enhancing brain tumors on magnetic resonance imaging: intraindividual crossover comparison of gadobenate dimeglumine and gadopentetate dimeglumine for visualization and assessment, and implications for surgical intervention. J Neurosurg. 2007;106:557-566. Soulez G, Bloomgarden DC, Rofsky NM, et al. Prospective Cohort Study of Nephrogenic Systemic Fibrosis in Patients with Stage 3-5 Chronic Kidney Disease Undergoing MRI with Injected Gadobenate Dimeglumine or Gadoteridol. Am J Roentgenol. 2015;205:469-478. American College of Radiology (ACR) Committee on Drugs and Contrast Media. ACR Manual on Contrast Media, Version 10.2. 2016. Available at http://www.acr.org/~/media/ACR/Documents/PDF/QualitySafety/Resources/Contrast%20Manual/FullManual.pdf. Accessed July 23, 2016. Morgan DE, Spann JS, Lockhart ME, Winningham B, Bolus DN. Assessment of adverse reaction rates during gadoteridol-enhanced MR imaging in 28,078 patients. Radiology. 2011;259:109-116. Debatin JF, Nadel SN, Gray L, et al. Phase III clinical evaluation of gadoteridol injection: experience in pediatric neuro-oncologic MR imaging. Pediatr Radiol. 1992;22:93-98. Yuh WT, Fisher DJ, Engelken JD, et al. MR evaluation of CNS tumors: dose comparison study with gadopentetate dimeglumine and gadoteridol. Radiology. 1991;180:485-491. Greco A, Parker JR, Ratcliffe CG, Kirchin MA, McNamara MT. Phase III, randomized, double-blind, cross-over comparison of gadoteridol and gadopentetate dimeglumine in magnetic resonance imaging of patients with intracranial lesions. Australas Radiol. 2001;45:457-463. Maravilla KR, Smith MP, Vymazal J, et al. Are there differences between macrocyclic gadolinium contrast agents for brain tumor imaging? Results of a multicenter intraindividual crossover comparison of gadobutrol with gadoteridol (the TRUTH study). Am J Neuroradiol. 2015;36:14-23. Wolansky LJ, Finden SG, Chang R, et al. Gadoteridol in multiple sclerosis patients. A comparison of single and triple dose with immediate vs. delayed imaging. Clin Imaging. 1998;22:385-392. White GW, Gibby WA, Tweedle MF. Comparison of Gd (DTPA-BMA) (Omniscan™) versus Gd (HP-DO3A) (ProHance® relative to gadolinium retention in human bone tissue by inductively coupled plasma mass spectroscopy. Invest Radiol. 2006;41:272-278. High WA, Ayers RA, Chandler J, Zito G, Cowper SE. Gadolinium is detectable within the tissue of patients with nephrogenic systemic fibrosis. J Am Acad Dermatol. 2007;56:21-26. Kanda T, Ishii K, Kawaguchi H, Kitajima K, Takenaka D. High signal intensity in the dentate nucleus and globus pallidus on unenhanced T1-weighted MR images: relationship with increasing cumulative dose of a gadolinium-based contrast material. Radiology. 2014; 270: 834-841. McDonald RJ, McDonald JS, Kallmes DF, et al. Intracranial Gadolinium Deposition after Contrast-enhanced MR Imaging. Radiology. 2015;275:772-782. Errante Y, Cirimele V, Mallio CA, Di Lazzaro V, Zobel BB, Quattrocchi CC. Progressive increase of T1 signal intensity of the dentate nucleus on unenhanced magnetic resonance images is associated with cumulative doses of intravenously administered gadodiamide in patients with normal renal function, suggesting dechelation. Invest Radiol. 2014;49: 685-690. Ramalho J, Castillo M, AlObaidy M, Nunes RH, Ramalho M, Dale BM, Semelka RC. High Signal Intensity in Globus Pallidus and Dentate Nucleus on Unenhanced T1-weighted MR Images: Evaluation of Two Linear Gadolinium-based Contrast Agents. Radiology. 2015; 276: 836-844. Robert P, Lehericy S, Grand S, et al. T1-Weighted Hypersignal in the Deep Cerebellar Nuclei After Repeated Administrations of Gadolinium-Based Contrast Agents in Healthy Rats: Difference Between Linear and Macrocyclic Agents. Invest Radiol. 2015;50:473-480. Radbruch A, Weberling LD, Kieslich PJ, et al. High-signal intensity in the dentate nucleus and globus pallidus on unenhanced T1-weighted images: evaluation of the macrocyclic gadolinium-based contrast agent gadobutrol. Invest Radiol. 2015;50:805-810. Robert P, Violas X, Grand S, et al. Linear Gadolinium-Based Contrast Agents Are Associated With Brain Gadolinium Retention in Healthy Rats. Invest Radiol. 2016;51:73-82. Murata N, Gonzalez-Cuyar LF, Murata K, et al. Macrocyclic and Other Non-Group 1 Gadolinium Contrast Agents Deposit Low Levels of Gadolinium in Brain and Bone Tissue: Preliminary Results From 9 Patients With Normal Renal Function. Invest Radiol. 2016;51:447-453. US Food and Drug Administration (FDA). Gadolinium-based contrast agents for magnetic resonance imaging (MRI): Drug Safety Communication - FDA evaluating the risk of brain deposits with repeated use. July 27, 2015. http://www.fda.gov/Safety/MedWatch/SafetyInformation/SafetyAlertsforHumanMedicalProducts/ucm456012.htm. Accessed August 6, 2015. Welk B, McArthur E, Morrow SA, MacDonald P, Hayward J, Leung A, Lum A. Association Between Gadolinium Contrast Exposure and the Risk of Parkinsonism. JAMA. 2016;316:96-98. Dotarem® (gadoteric acid) [product information]. Roissy CdG Cedex, France: Guerbet; March 2014. Gadavist® (gadobutrol) injection [prescribing information]. Wayne, NJ; Bayer HealthCare Pharmaceuticals; April 2016. Magnevist® (brand of gadopentetate dimeglumine) injection [prescribing information].Wayne, NJ: Bayer HealthCare Pharmaceuticals; June 2014. MultiHance® (gadobenate dimeglumine) injection [prescribing information]. Princeton, NJ; Bracco Diagnostics Inc.; July 2013. Omniscan™ (gadodiamide) injection [prescribing information]. Princeton, NJ: GE Healthcare; August 2013. OptiMARK™ (gadoversetamide) injection [prescribing information]. St. Louis, MO: Covidien Medical; October 2014. Shen Y, Goerner FL, Snyder C, et al. T1 relaxivities of gadolinium-based magnetic resonance contrast agents in human whole blood at 1.5, 3, and 7 T. Invest Radiol. 2015;50:330-338. Use of ProHance® (Gadoteridol): A Safe, Effective, and Versatile Contrast Agent for MR Imaging. Appl Radiol.